PRINCE Charles spends most of the year travelling around the world and sampling all sorts of local dishes. But even the future King of England was left lost for words when he discovered he had just been served green ants by MasterChef's contestants. During a highly-anticpated appearance on Wednesday night's episode of the cooking show, contestants were given the mammoth task of preparing a meal for the Prince of Wales. 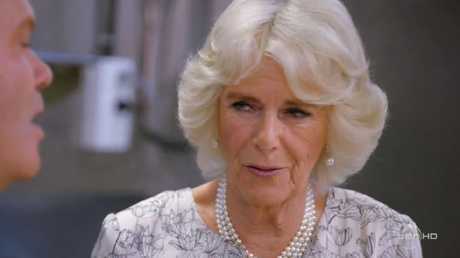 Earlier in the episode, Duchess of Cornwall made a number of candid confessions about her and Prince Charles' food preferences, confirming they avoided garlic like the plague and always keep ketchup in their fridge. To help them plan a menu, Camilla told MasterChef's contestants what the royal couple liked to eat. Admitting she was "very good at a roast and vegetables" and loved olive oil, Camilla said Charles was a big fan of local cheeses and liked eating home grown food. 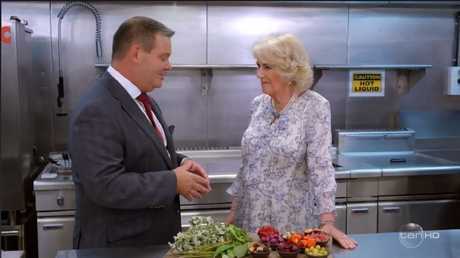 When asked by judge Gary Mehigan what foods she couldn't live without in her fridge, the Duchess of Cornwall had a surprising confession. "I have to have, if I haven't got fresh tomatoes, I'll always have tomato puree," Camilla said. "And I'm afraid to say, even ketchup. My grandchildren are rather addicted to ketchup." Camilla and Charles share nine grandchildren and step grandchildren between them, including Prince George, Princess Charlotte and Prince Louis. When asked what food the contestants should absolutely not serve, Camilla didn't mince her words. "I hate to say this, but garlic," she said. "Garlic is a no-no." "Because you're talking, chatting?" Gary asked. "Exactly. It's always so - you just have to lay off the garlic," Camilla replied. Setting out to impress the future king of England, contestants whipped an array of canapés using Australian ingredients. While the wallaby tartare and goat's cheese mousse with bush spices were well received, pickled cucumber seasoned with green ants raised eyebrows. "I'm particularly partial about local ingredients. And that's what makes it so fascinating is the diversity. So, what are all these things?" Charles asked as he inspected the contestant's dishes. We've got some muntries on here, local green ants on these canapés," judge Matt Preston explained. "Green ants!" Charles exclaimed with shock. Revealing his "darling wife" watched MasterChef, the prince also had some words of advice for the contestants. "it's always worth competing, even if you don't win, isn't it?" he said.